Now that I’ve got my blogging mojo back, I’ve been revisiting all my old haunts to see what I’ve been missing out on. Getting back up to speed in the world of social media. 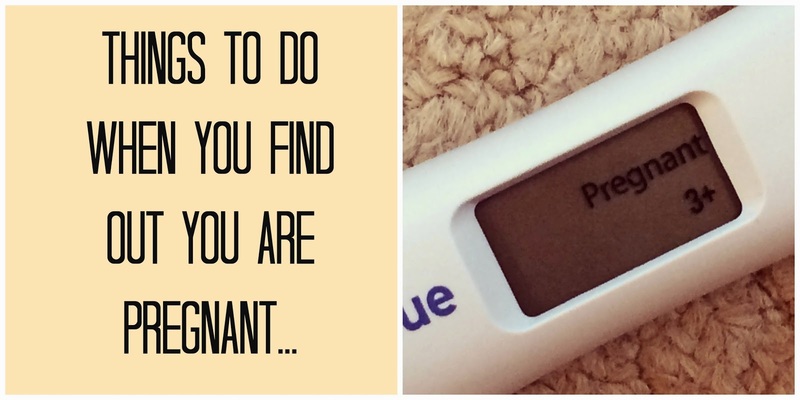 Whilst mooching around Pinterest, I stumbled upon a post that really grabbed my attention- ’14 Things to do when you find out you are pregnant’. Ooh, I thought, how intriguing…let’s see what things I did or didn’t do, wish that I had done etc. Apparently, the guilt train is inevitable for all parents, so why not jump on board from the get-go. Keeping a pregnancy journal, taking your vitamins and making a doctors appointment is all very good and sensible, but reading the list made me chuckle as I thought back to the day we found out we were pregnant. However much we worked for it, tried for it and wished for it, I don’t think I was entirely prepared for it. So I thought I’d compile my very own version of the list, just for a laugh. Which is exactly what I did do. Only moving to pee, get food supplies or more tissues to mop up my never-ending stream of sobbing tears. Shortly after we discovered that we were going to be parents the Hubster had to leave for work so I did what any normal person would do when they’re in shock. I went back to bed and cried for pretty much most of the day. OK, so I might have been a little confused. Not particularly helped by the Hubster reassuring me that the chances of our child coming out looking like a three-piece-suite were very slim and that the disease I was referring to was in fact FAS, ‘Foetal Alcohol Syndrome‘. Drinking aside, what about the foods I’d scoffed? The caffeine I’d consumed? The hot tubs I’d lounged in! The lifting, the workouts, the gymnastics? OK so there weren’t any gymnastics, but there could have been. I found myself searching the internet for ‘things not to do when you’re pregnant‘. Aside from smoking, drugs and sky diving, I’d covered pretty much most of them. The guilt was overwhelming…no wonder I was in bits. But you need to check that your eyes weren’t deceiving you. That this snotty state you find yourself in isn’t a dream. You’ll check that stick as much as possible until that little screen fades away…in my case after about two weeks. Yes I checked it on a daily basis. They will make you feel so much better. Big Fat NOT. These crooked corners of cyberspace aren’t overseen by level headed guardian angels. Oh no. They are fuelled by other completely irrational hormonal crazed women- just like you. You’ll only slump away from the screen with a zillion more fears and worries. Step away…and do something else to take your mind off babies altogether. But not ‘What to Expect When You’re Expecting’. This perhaps isn’t the wisest of moves to make when you’re already in a fragile state of mind. Covered in you’re own snot and genuinely concerned that your baby will come out asking for a glass of prosecco instead of milk. May I suggest watching something like Dumb & Dumber, or Beauty & the Beast as opposed to something purely focused on the honest lows, highs and the nitty gritty side to having a baby. If you’re planning on keeping your little bean a secret until that all important first scan, then now is the time to get your story straight. Why can’t you eat that yummy parma ham that’s in front of you? Why do you keep nipping to the loo to pee or chuck up? Have your excuses and your poker face at the ready because you’re going to need them. Seriously I reckon I’ve clocked up enough lies and indiscretion points to bag me a job with MI6. It was as if our little blob of a baby waited until we realised that it was cooking. It then decided to hit me with a big fat payback bat in the form of sickness, exhaustion and a severe dose of constipation for good measure. Brilliant. Every pregnancy is different. Try not to compare yourself to your friends or (even worse) other pregnant chicks on internet forums. Whatever you do when you discover that you’re pregnant, the most important thing is to take care of yourself and the blob/baby. You can’t change the past, only the future. As much as the worry and guilt still hangs over me, there’s not an awful lot that I can do now than be positive, be sensible, stay healthy. Oh, and step away from programmes like One Born Every Minute, because there’s no going back now. Eek! What did you do when you found out you were pregnant?